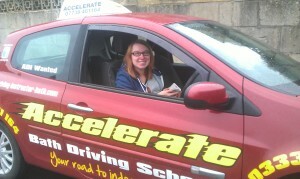 ” Having recently moved to bath I chose Accelerate bath Driving School because of the reviews I read on Google. I was not disappointed by the instruction that I received, it was brilliant especially the in car video. I was able to watch back my lessons and really learn from them. I would highly recommend Accelerate Bath Driving School to all my friends. 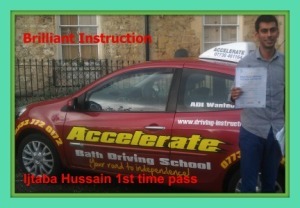 Thanks Steve for helping me pass.” Ijtaba Hussain, Bath. “Since changing to Stephen Paraskeva at Accelerate Bath Driving School from my old instructor, I am now learning a lot better. There is now a structure to the lessons, we recap the last lesson at the start. Then we decide together what i need to work on in the lesson, and at the end with questions he finds out what i have learnt in the lesson. He also fills in a progress sheet to keep a record of what i have covered and how i am doing in each subject. We then discuss what we will work on in the next lesson, so i have a chance to find out about the subject.